Kona Kava Farm is an organic farm nestled in the heart of the fertile slopes of Hawaii’s Hualalai Mountain, world renowned as the Kona Coffee Belt. This area is prized for its unique micro-nutrients and perfect climactic conditions, producing the taste essences of the tropics. We specialize in ‘Awa (kava) nurtured with fragrant breezes and tropical sunlight, harvested only at peak strength, and then dried naturally by the sea. We use 90% underground root and 10% lateral roots for our kava kava, with no added stems, leaves, or fillers of any kind. Since ancient times, the people of the Pacific island cultures have traditionally prepared ‘Awa (Hawaiian for kava) root as a strong-tasting drink. 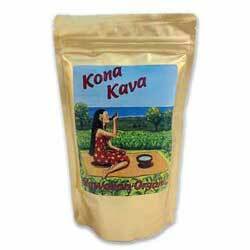 Kona Kava Farm’s Instant Kava Powder Mix delivers the benefits of Kava root as a dietary supplement that you prepare as a drink, but without the strong taste. Finally, a Kava supplement product that any responsible adult can enjoy; Kona Kava Farm's Instant Kava Mix. This instant Kava mix contains a genuine extract of Kava root and not something only "micronized." Typically, competing products grind the Kava powder so fine that it seems as though it dissolves in water, but Kona Kava Farm's Instant Kava Mix will dissolve completely in water. This saves the mess of extractions with plain Kava root; a ritual that many people enjoy, but also one that many customers find inconvenient. For a delicious supplement that naturally promotes relaxation and helps ease the mind from daily stress,* this instant drink mix supplement supplies a concentrated extract (4:1) of Kava root (Piper methysticum) in a delicious blend of all-natural ingredients: soy powder, sugar, cocoa powder, cinnamon powder, and nutmeg powder. Instructions: For each serving, simply put 2 rounded teaspoons into 5 ounces (200 mL) of water, stir thoroughly. A blender works best for mixing.